A truthful collection of lies. 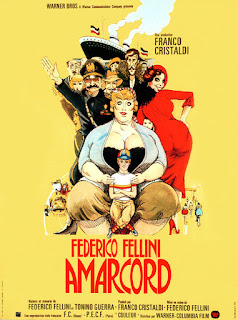 Amarcord is a bit much to wrap your head around in a single viewing. Generally speaking, there's no central protagonist or plot, and instead of this traditional narrative structure, the film offers what is basically a series of vignettes that involve a similar set of characters and that take place in a similar setting. What it's about isn't totally obvious—which is probably for the best, rather than having them shallowly play out on the surface—but what is obvious is that it's less a customary story about a single person and more a chaotic poem about a specific place and time. Most of the events of Amarcord occur in a small, rural village in Italy, and they work together to create an atmosphere of absurdist, flamboyant vulgarity. The film opens with a bacchanalian festival of the changing of the seasons from winter into spring, a celebration which involves a large crowd, a massive fire, an old prostitute, and an abundance of raucous debauchery. As we take a closer look into this town, we see a wide variety of obscene bodily functions barely covered (if at all) by the thin blanket of polite society: in school, a boy rolls up a poster and uses it to pee into the front row; at home, an old man leaves the dinner table (and the camera follows him) in order to fart in an adjoining room. Even the narrator isn't safe: people interrupt him and throw snowballs at him, and he himself even admits that what he's saying is probably not true. The public sphere is bursting at the seams with this explosion of private indecency. This begins to take on an added layer of meaning next to subtle clues about the film's historical and cultural context. In one particularly illuminating scene, a military march (an excessively joyful, almost euphoric one) ends in the raising of a Mussolini portrait made of flowers. This scene itself is imbued with its own sense of comedy ("Mussolini has balls this big!") that begins to undercut the power and authority on display, but in the larger context of the rest of the film it beings to shape the story into a satire of ideology. Along with earlier scenes, which depicted interruptions of presupposed "polite society," we can begin to see a commentary on the absurdity and silliness of rigid ideological structures. The cold, disconnected rituals of propriety (like the teachers completely caught up in their own lessons) are contrasted against the lively (if somewhat crude) vital energy of pure humanity. Amarcord is a little difficult to get into at the beginning—it often feels like an extension of the final scene of 8 ½ without Marcello Mastroianni—but once you find your way in, it's a wonderfully funny and fascinating portrait of a specific mood felt at a special time and place.